For other uses, see Adal. The Adal Sultanate, or Kingdom of Adal (alt. 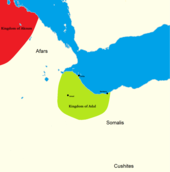 spelling Adel Sultanate), was a Muslim Somali kingdom and sultanate located in the Horn of Africa. It was founded by Sabr ad-Din II after the fall of the Sultanate of Ifat. The kingdom flourished from around 1415 to 1577. The sultanate and state were established by the local inhabitants of Zeila. At its height, the polity controlled most of the territory in the Horn region immediately east of the Ethiopian Empire (Abyssinia). The Adal Empire maintained a robust commercial and political relationship with the Ottoman Empire. Approximate extension of the Adal Sultanate. Adal is believed to be an abbreviation of Havilah. Eidal or Aw Abdal, was the Emir of Harar in the eleventh century. In the thirteenth century, Arab writer Al Dimashqi refers to the Adal Sultanate's capital, Zeila, by its Somali name "Awdal" (Somali: "Awdal"). The modern Awdal region, which was part of the Adal Sultanate, bears the kingdom's name. The Kingdom of Adal (also Awdal, Adl, or Adel) was centered around Zeila, its capital. It was established by the local Somali tribes in the early 9th century. Zeila attracted merchants from around the world, contributing to the wealth of the city. Zeila is an ancient city and it was one of the earliest cities in the world to embrace Islam. In the late 9th century, Al-Yaqubi, an Armenian Muslim scholar and traveller, wrote that the Kingdom of Adal was a small wealthy kingdom and that Zeila served as the headquarters for the kingdom, which dated back to the beginning of the century. Islam was introduced to the Horn region early on from the Arabian peninsula, shortly after the hijra. Zeila's two-mihrab Masjid al-Qiblatayn dates to about the 7th century, and is the oldest mosque in Africa. In the late 9th century, Al-Yaqubi wrote that Muslims were living along the northern Somali seaboard. The polity was governed by local Somali dynasties established by the Adelites. Adal's history from this founding period forth would be characterized by a succession of battles with neighbouring Abyssinia. Yusuf bin Ahmad al-Kawneyn was born in Zeila during the Adal Kingdom period. Al-Kawneyn is a Somali Muslim saint. He is believed to be the founder and ancestor of the royal family known as the Walashma Dynasty, which later governed both the Ifat Sultanate and the Adal Sultanate during the Middle Ages. According to the 16th-century explorer Leo Africanus, the Adal Sultanate's realm encompassed the geographical area between the Bab el Mandeb and Cape Guardafui. It was therefore flanked to the south by the Ajuran Empire (Kingdom of Ajuuran) and to the west by the Abyssinian Empire (Abassin Empire). Adal is mentioned by name in the 14th century in the context of the battles between the Muslims of the Somali and Afar seaboard and the Abyssinian King Amda Seyon I's Christian troops. Adal originally had its capital in the port city of Zeila, situated in the northwestern Awdal region. The polity at the time was an Emirate in the larger Ifat Sultanate ruled by the Walashma dynasty. In 1332, the King of Adal was slain in a military campaign aimed at halting Amda Seyon's march toward Zeila. When the last Sultan of Ifat, Sa'ad ad-Din II, was killed by Dawit I of Ethiopia at the port city of Zeila in 1410, his children escaped to Yemen, before later returning in 1415. In the early 15th century, Adal's capital was moved further inland to the town of Dakkar, where Sabr ad-Din II, the eldest son of Sa'ad ad-Din II, established a new Adal administration after his return from Yemen. During this period, Adal emerged as a center of Muslim resistance against the expanding Christian Abyssinian kingdom. Adal would thereafter govern all of the territory formerly ruled by the Ifat Sultanate, as well as the land further east all the way to Cape Guardafui, according to Leo Africanus. After 1468, a new breed of rulers emerged on the Adal political scene. The dissidents opposed Walashma rule owing to a treaty that Sultan Muhammad ibn Badlay had signed with Emperor Baeda Maryam of Ethiopia, wherein Badlay agreed to submit yearly tribute. This was done to achieve peace in the region, though tribute was never sent. Adal's Emirs, who administered the provinces, interpreted the agreement as a betrayal of their independence and a retreat from the polity's longstanding policy of resistance to Abyssinian incursions. The main leader of this opposition was the Emir of Zeila, the Sultanate's richest province. As such, he was expected to pay the highest share of the annual tribute to be given to the Abyssinian Emperor. Emir Laday Usman subsequently marched to Dakkar and seized power in 1471. However, Usman did not dismiss the Sultan from office, but instead gave him a ceremonial position while retaining the real power for himself. Adal now came under the leadership of a powerful Emir who governed from the palace of a nominal Sultan. Adalite armies under the leadership of rulers such as Sabr ad-Din II, Mansur ad-Din, Jamal ad-Din II, Shams ad-Din and general Mahfuz subsequently continued the struggle against Abyssinian expansionism. In the 16th century, Adal organised an effective army led by Imam Ahmad ibn Ibrahim al-Ghazi that invaded the Abyssinian empire. This campaign is historically known as the Conquest of Abyssinia or Futuh al Habash. During the war, Ahmed pioneered the use of cannons supplied by the Ottoman Empire, which were deployed against Solomonic forces and their Portuguese allies led by Cristóvão da Gama. Some scholars argue that this conflict proved, through their use on both sides, the value of firearms such as the matchlock musket, cannons and the arquebus over traditional weapons. 1 Sulṭān SabiradDīn SaʿadadDīn 1415–1422 Son of SaʿadadDīn Aḥmed. Won some early victories before being soundly defeated by Emperor Yeshaq. 2 Sulṭān Mansur SaʿadadDīn 1422–1424 Son of SaʿadadDīn Aḥmed. Defeated the Abyssinians at Yedaya, only to be defeated and imprisoned by Yeshaq. 3 Sulṭān JamaladDīn SaʿadadDīn 1424–1433 Won several important battles before being defeated at Harjai, he was assassinated in 1433. 4 Sulṭān AḥmedudDīn "Badlay" SaʿadadDīn 1433–1445 Son of SaʿadadDīn Aḥmed, known to the Abyssinians as "Arwe Badlay" ("Badlay the Monster"). AḥmedudDīn turned the tide of war against the Abyssinians and decisively defeated the forces of Emperor Yeshaq and liberated the land of Ifat. AḥmedudDīn founded a new capital at Dakkar in the Adal region, near Harar, creating the Sultanate of Adal. He was killed in battle after he had launched a jihad to push the Abyssinians back out of Dawaro. 5 Sulṭān Maḥamed AḥmedudDīn 1445–1472 Son of AḥmedudDīn "Badlay" SaʿadadDīn, Maḥamed asked for help from the Mameluk Sultanate of Egypt in 1452, though this assistance was not forthcoming. He ended up signing a very short-lived truce with Baeda Maryam. 6 Sulṭān ShamsadDin Maḥamed 1472–1488 Son of Maḥamed AḥmedudDīn, he was attacked by Emperor Eskender of Abyssinia in 1479, who sacked Dakkar and destroyed much of the city, though the Abyssinians did not attempt to occupy the city and were ambushed on the way home with heavy losses. 7 Sulṭān Maḥamed ʿAsharadDīn 1488–1518 Great-grandson of SaʿadadDīn Aḥmed of Ifat, he continued to fight to liberate Dawaro along with Garad Maḥfūẓ of Zeila. He was assassinated after a disastrous campaign in 1518 and the death of Garad Maḥfūẓ. 9 Sulṭān Abūbakar Maḥamed 1518–1526 He killed Garād Abūn and restored the Walashma dynasty, but Garād Abūn's cousin Imām Aḥmed Gurēy avenged his cousin's death and killed him. While Garād Abūn ruled in Dakkar, Abūbakar Maḥamed established himself at Harar in 1520, and this is often cited as when the capital moved. Abūbakar Maḥamed was the last Walashma sultan to have any real power. 10 Garād Abūn ʿAdādshe 1519–1525 Successor to Maḥamed Abūbakar Maḥfūẓ and the Karanle party of the struggle for the throne. 11 Sulṭān ʿUmarDīn Maḥamed 1526–1553 Son of Maḥamed ʿAsharadDīn, Imām Aḥmed Gurēy put Maḥamed ʿAsharadDīn's young son ʿUmarDīn on the throne as puppet king in Imām Aḥmed Gurēy's capital at Harar. This essentially is the end of the Walashma dynasty as a ruling dynasty in all but name, though the dynasty hobbled on in a de jure capacity. Many king lists don't even bother with Walashma rulers after this and just list Imām Aḥmed Gurēy and then Amīr Nūr Mujahid. 13 Sulṭān Barakat ʿUmarDīn 1555–1559 Son of ʿUmarDīn Maḥamed, last of the Walashma Sultans, assisted Amīr Nūr Mujahid in his attempt to retake Dawaro. He was killed defending Harar from Emperor Gelawdewos, ending the dynasty. The Walashma dynasty of the Ifat and Adal sultanates all possessed Somali genealogical traditions. During Adal's initial period, when it was centered in city of Zeila in the present-day northwestern Awdal region, the kingdom was primarily composed of Somalis (Predominantly), Afars, Hararis and Arabs. While his camp was being pitched, the king of Zeila Imam Ahmad ascended a hill with several horse and some foot to examine us: he halted on the top with three hundred horse and three large banners, two white with red moons, and one red with a white moon, which always accompanied him, and [by] which he was recognized. Of the early history of the Imam Ahmad but little is known. He was the son of one Ibrahim el Ghazi, and both he and his father were common soldiers in the troop of Garad Aboun. Nothing even is said as to his nationality. He was certainly not an Arab : probably he was a Somali, for we find him closely connected with many who were Somalis. According to Leo Africanus (1526) and George Sale (1760), the Adelites were of a tawny brown or olive complexion on the northern littoral, and grew swarthier towards the southern interior. They generally had long, lank hair. Most wore a cotton sarong but no headpiece or sandals, with lots of glass and amber trinkets around their necks, wrists, arms and ankles. The king and other aristocrats often donned instead a body-length garment topped with a headdress. All were Muslims. In the southern hinterland, the Adelites lived beside pagan "Negroes", with whom they bartered various commodities. Various languages from the Afro-Asiatic family were spoken in the vast Adal Sultanate. Arabic served as a lingua franca, and was used by the ruling Walashma dynasty. Somali was the most commonly used language of government and social life while Arabic was most prominently used for religious studies. During its existence, Adal had relations and engaged in trade with other polities in Northeast Africa, the Near East, Europe and South Asia. Many of the historic cities in the Horn of Africa such as Abasa and Berbera flourished under its reign with courtyard houses, mosques, shrines, walled enclosures and cisterns. Adal attained its peak in the 14th century, trading in slaves, ivory and other commodities with Abyssinia and kingdoms in Arabia through its chief port of Zeila. The cities of the empire imported intricately colored glass bracelets and Chinese celadon for palace and home decoration. The Adalite military was divided into several sections such as the infantry consisting of swordsmen, archers and lancers that were commanded by various generals and lieutenants. These forces were complimented by a cavalry force and eventually, later in the empire's history, by matchlock-technology and cannons during the Conquest of Abyssinia. The various divisions were symbolised with a distinct flag. The Adal soldiers donned elaborate helmets and steel armour made up of chain-mail with overlapping tiers. The Horsemen of Adal wore protective helmets that covered the entire face except for the eyes, and breastplates on their body, while they harnessed their horses in a similar fashion. In siege warfare, ladders were employed to scale buildings and other high positions such as hills and mountains. Somali forces contributed much to the Imām’s victories. Shihāb ad-Dīn, the Muslim chronicler of the period, writing between 1540 and 1560, mentions them frequently (Futūḥ al-Ḥabasha, ed. And trs. R. Besset Paris, 1897). The most prominent Somali groups in the campaigns were the Geri, Marrehān, and Harti – all Dārod clans. Shihāb ad-Dīn is very vague as to their distribution and grazing areas, but describes the Harti as at the time in possession of the ancient eastern port of Mait. Of the Isāq only the Habar Magādle clan seem to have been involved and their distribution is not recorded. Finally, several Dir clans also took part. The sultanate of Adal, which emerged as the major Muslim principality from 1420 to 1560, seems to have recruited its military force mainly from among the Somalis. The Abyssinian–Adal war was a military conflict between the Ethiopian Empire and the Adal Sultanate that took place from 1529 until 1543. Abyssinian troops consisted of Amhara, Tigrayan and Agew ethnic groups. Adal forces consisted mostly of Afar, Somali, Harla, Argobba, Arab, formations supported by the Ottomans. In the mid-1520s, Imam Ahmad ibn Ibrahim al-Ghazi assumed control of Adal and launched a war against Abyssinia (Ethiopian Empire), which was then under the leadership of Dawit II (Lebna Dengel). Supplied by the Ottoman Empire with firearms, Ahmad was able to defeat the Abyssinians at the Battle of Shimbra Kure in 1529 and seize control of the wealthy Ethiopian highlands, though the Abyssinians continued to resist from the highlands. In 1541, the Portuguese, who had vested interests in the Indian Ocean, finally sent aid to the Abyssinians in the form of 400 musketeers. Adal, in response, received 900 from the Ottomans. Imam Ahmad was initially successful against the Abyssinians while campaigning in the Autumn of 1542, killing the Portuguese commander Cristóvão da Gama in August that year. However, Portuguese musketry proved decisive in Adal's defeat at the Battle of Wayna Daga, near Lake Tana, in February 1543, where Ahmad was killed in battle. The Abyssinians subsequently retook the Amhara plateau and recouped their losses against Adal. The Ottomans, who had their own troubles to deal with in the Mediterranean, were unable to help Ahmad's successors. When Adal collapsed in 1577, the seat of the Sultanate shifted from Harar to Aussa in the desert region of Afar and a new sultanate began. After the death of Imam Ahmad, the Adal Sultanate lost most of its territory in Abyssnian lands. In 1550 Nur ibn Mujahid assumed power after he killed Abyssinian emperor Gelawdewos. Due to constant Oromo raids both Adal and Abyssinian rulers struggled to consolidate power outside of their realms. During the rule of Muhammed Jasa in 1577 he transferred the capital from Harar to Aussa. The Adal Sultanate subsequently ended due to infighting with Somali tribes. After the conflict between Adal and Abyssinia had subsided, the conquest of the highland regions of Abyssinia and Adal by the Oromo (namely, through military expansion and the installation of the Gadaa socio-political system) ended in the contraction of both powers and changed regional dynamics for centuries to come. In essence, what had happened is that the populations of the highlands had not ceased to exist as a result of the Gadaa expansion, but were simply incorporated into a different socio-political system. The Adal Sultanate left behind many structures and artefacts from its heyday. Numerous such historical edifices and items are found in the northwestern Awdal province of Somalia, as well as other parts of the Horn region where the polity held sway. Archaeological excavations in the late 19th century and early 20th century at over fourteen sites in the vicinity of Borama in modern-day northwestern Somalia unearthed, among other artefacts, silver coins identified as having been derived from Qaitbay (1468–89), the eighteenth Burji Mamluk Sultan of Egypt. Most of these finds are associated with the medieval Adal Sultanate. They were sent to the British Museum for preservation shortly after their discovery. In 1950, the British Somaliland protectorate government commissioned an archaeological survey in twelve desert towns in present-day Somaliland, near the border with Ethiopia. According to the expedition team, the sites yielded the most salient evidence of late medieval period affluence. They contained ruins of what were evidently once large cities belonging to the Adal Sultanate. Three of the towns in particular, Abasa, Gogesa and Amud, featured between 200 and 300 stone houses. The walls of certain sites still reportedly stood 18 meters high. Excavations in the area yielded 26 silver coins, unlike the copper pieces that were more common in polities below the Horn region. The earliest of these recovered coins had been minted by Sultan Barquq (1382–99), also of the Egyptian Burji dynasty, and the latest were again Sultan Qaitbay issues. All of the pieces had been struck in either Cairo or Damascus. A few gold coins were also discovered during the expedition, making the area the only place in the wider region to yield such pieces. Besides coinage, high quality porcelain was recovered from the Adal sites. The fine celadon ware was found either lying on the surface, or buried at a depth of seven and a half inches, or ensconced within dense middens four to five feet high. Among the artefacts were grey granular sherds with a crackled blue-green or sea-green glaze, and white crystalline fragments with an uncrackled green-white glaze. Some Ming dynasty ware was also discovered, including many early Ming blue-and-white bowl sherds. They were adorned with tendril scrolls on a bluish ground and ornamented with black spotting, while other bowls had floral patterns outlined by grey or black-blue designs. Additionally, a few Ming red-and-white sherds were found, as well as white porcelain fragments with bluish highlights. The Adal sites appeared to reach an Indian Ocean terminus at the Sa'ad ad-Din Islands, named for Sultan Sa'ad ad-Din II of the Ifat Sultanate. 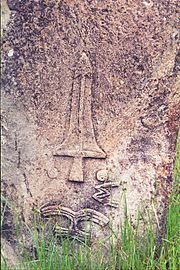 Additionally, local tradition identifies the archaeological site of Tiya in central Ethiopia as Yegragn Dingay ("Gran's stone") in reference to Imam Al-Ghazi. According to Joussaume (1995), who led archaeological work there, the site is relatively recent. It has been dated to between the 11th and 13th centuries CE. Tiya contains a number of megalithic pillars, including anthropomorphic and non-anthropomorphic/non-phallic stelae. Flat in form, these structures are characterized by distinctive, elaborate decorations, among which are swords, a standing human figure with arms akimbo, and plant-like symbols. ^ elrik, Haggai (2007). "The Cambridge History of Africa: From c. 1050 to c. 1600". Basic Reference. USA: Lynne Rienner. 28: 36. doi:10.1017/S0020743800063145. Retrieved 2012-04-27. ^ Fage, J.D (2010). "The Cambridge History of Africa: From c. 1050 to c. 1600". ISIM Review. UK: Cambridge University Press (Spring 2005): 169. Retrieved 2009-04-10. ^ a b David Hamilton Shinn & Thomas P. Ofcansky (2004). Historical Dictionary of Ethiopia. Scarecrow Press. p. 5. ISBN 0810849100. ^ Østebø, Terje (2011-09-30). Localising Salafism: Religious Change Among Oromo Muslims in Bale, Ethiopia. BRILL. ISBN 9004184783. ^ Salvadore, Matteo (2016). The African Prester John and the Birth of Ethiopian-European Relations, 1402–1555. Routledge. p. 158. ISBN 1317045467. Retrieved 18 March 2018. ^ Gifford, William (1844). "Forster on Arabia". The Quarterly Review. 74: 338. ^ Wehib, Ahmed (October 2015). History of Harar and the Hararis (PDF). Harari People Regional State Culture, Heritage And Tourism Bureau. p. 105. Retrieved 26 July 2017. ^ a b c d e f g h Lewis, I. M. (1999). A Pastoral Democracy: A Study of Pastoralism and Politics Among the Northern Somali of the Horn of Africa. James Currey Publishers. p. 17. ISBN 0852552807. ^ Fage, J.D (2010). "The Cambridge History of Africa: From c. 1050 to c. 1600". ISIM Review. UK: Cambridge University Press (Spring 2005): 139. ^ Lewis, I. M. (1999-01-01). A Pastoral Democracy: A Study of Pastoralism and Politics Among the Northern Somali of the Horn of Africa. James Currey Publishers. ISBN 9780852552803. ^ Shinn, David H.; Ofcansky, Thomas P. (2013-04-11). Historical Dictionary of Ethiopia. Scarecrow Press. ISBN 9780810874572. ^ Pieter, Esterhuysen (2013-12-07). Africa A to Z: Continental and Country Profiles: Third Edition. Africa Institute of South Africa. ISBN 9780798303446. ^ "Image: The Travels of Al-Yaqubi" (PNG). Image.prntsacr.com. Retrieved 28 November 2018. ^ M. H. Mukhtar, 'Adal Sultanate', in The Encyclopedia of Empire (Wiley, 2016), doi:10.1002/9781118455074.wbeoe145; ISBN 9781118455074. ^ a b c Lewis, I.M. (1955). Peoples of the Horn of Africa: Somali, Afar and Saho. International African Institute. p. 140. ^ a b c d Africanus, Leo (1526). The History and Description of Africa. Hakluyt Society. pp. 51–54. ^ a b "Saints and Somalis: Popular Islam in a Clan-based Society"; Lewis, I.M. ; The Red Sea Press; (1998); retrieved 22 September 2015. ^ Nehemia Levtzion; Randall Pouwels (Mar 31, 2000). The History of Islam in Africa. Ohio University Press. p. 242. ^ Northeast African Studies. Volume 11. African Studies Center, Michigan State University. 1989. p. 115. ^ a b Houtsma, M. Th (1987). E.J. Brill's First Encyclopaedia of Islam, 1913–1936. BRILL. pp. 125–126. ISBN 9004082654. ^ mbali (2010). "Somaliland". Basic Reference. London, UK: mbali. 28: 217–229. doi:10.1017/S0020743800063145. Archived from the original on 2012-04-23. Retrieved 2012-04-27. ^ Briggs, Phillip. Somaliland. Bradt Travel Guides. Retrieved 25 April 2016. ^ Shelley, Fred M. (2013-04-23). Nation Shapes: The Story Behind the World's Borders: The Story behind the World's Borders. ABC-CLIO. ISBN 9781610691062. ^ zum (2007). "Event Documentation". Basic Reference. USA: AGCEEP. 28: 217–229. doi:10.1017/S0020743800063145. Retrieved 2012-04-27. ^ Trimingham, John (2007). "Islam in Ethiopia". Basic Reference. Oxford: Oxford University Press. 28: 167. Retrieved 2012-04-27. ^ Fage, J. D. (2007). "The Cambridge History of Africa: From c. 1050 to c. 1600". Basic Reference. USA: Cambridge University Press. 28: 167. doi:10.1017/S0020743800063145. Retrieved 2012-04-27. ^ Jeremy Black, Cambridge Illustrated Atlas, Warfare: Renaissance to Revolution, 1492–1792, (Cambridge University Press: 1996), p. 9. ^ Lewis, I. M (1998). Saints and Somalis: Popular Islam in a Clan-based Society. The Red Sea Press. p. 89. ^ Y. Mekonnen. Ethiopia: The Land, Its People, History and Culture. New Africa Pres. ^ Richard Stephen Whiteway (1902). The Portuguese Expedition to Abyssinia in 1541–1543 as Narrated by Castanhoso. Hakluyt Society. p. 41. ^ Richard Stephen Whiteway (1902). The Portuguese Expedition to Abyssinia in 1541–1543 as Narrated by Castanhoso. Hakluyt Society. p. 38. ^ Sale, George (1760). An Universal History, from the Earliest Account of Time, Volume 15. T. Osborne, A. Millar, and J. Osborn. pp. 361 & 367–368. Retrieved 1 July 2017. ^ Sale, George (1760). An Universal History, from the Earliest Account of Time, Volume 15. T. Osborne, A. Millar, and J. Osborn. p. 361. Retrieved 1 July 2017. The inhabitants along this last coast are mostly white, with long lank hair; but grow more tawny, or even quite black, as you proceed towards the south. Here are plenty of negroes who live and intermarry with the Bedowin Arabs, and carry on a great commerce with them, which consists in gold, slaves, horses, ivory, etc. ^ Giyorgis, Asma (1999). Aṣma Giyorgis and his work: history of the Gāllā and the kingdom of Šawā. Medical verlag. p. 257. ISBN 978-3-515-03716-7. ^ Fage, J.D (2010). "The Cambridge History of Africa: From c. 1050 to c. 1600". ISIM Review. UK: Cambridge University Press (Spring 2005): 139. Retrieved 2009-04-10. ^ Meri, Josef W.; Bacharach, Jere L. (2006-01-01). Medieval Islamic Civilization: A-K, index. Taylor & Francis. ISBN 9780415966917. ^ Lewis, I.M. (1960). "The Somali Conquest of Horn of Africa". Journal of African History. 1 (2): 223. Retrieved 18 March 2018. ^ Gikes, Patrick (2002). "Wars in the Horn of Africa and the dismantling of the Somali State". African Studies. University of Lisbon. 2: 89–102. Retrieved 7 November 2016. ^ Abir, Mordechai. Ethiopia and the Red Sea. Routledge. p. 139. Retrieved 19 January 2016. ^ Cassanelli, Lee (2007). "The shaping of Somali society: reconstructing the history of a pastoral people". Basic Reference. USA: University of Pennsylvania. 28: 311. doi:10.1017/S0020743800063145. Retrieved 2012-04-27. ^ "Cadernos de Estudos Africanos, "Wars in the Horn of Africa and the dismantling of the Somali State"". ^ Button, Richard. First Footsteps in East Africa. Tyston and Edwards. p. 12. Retrieved 21 January 2016. ^ Abir, Mordechai. Ethiopia and the Red Sea. Routledge. p. 139. Retrieved 21 January 2016. ^ a b University of Ghana, Institute of African Studies (1966). Research review, Volumes 3–4. The Institute. p. 67. Retrieved 6 October 2014. ^ a b Royal Geographical Society (Great Britain), The Geographical Journal, Volume 87, (Royal Geographical Society: 1936), p.301. ^ Bernard Samuel Myers, ed., Encyclopedia of World Art, Volume 13, (McGraw-Hill: 1959), p.xcii. ^ Fukui, Katsuyoshi (1997). Ethiopia in broader perspective: papers of the XIIIth International Conference of Ethiopian Studies Kyoto 12–17 December 1997. Shokado Book Sellers. p. 370. ISBN 4879749761. Retrieved 23 December 2014.